She's Fantastic: The Women of SPACE PRECINCT 2040! The Women of SPACE PRECINCT 2040! Gerry Anderson was the puppeteering genius behind the classic sci-fi series' Thunderbirds, Stingray, and Terrahawks (to name a few). Space Precinct 2040 was one of his last big endeavors but was unfortunately plagued with problems. The show began airing in 1994 and was cancelled after its first season. Space Precinct was created for both US and UK distribution but was unable to find a tone to satisfy both markets. It seems that there was a lot of sub-par work, exaggerations about funding, and inappropriate timeslots adding to its early demise. There was even a documentary about the behind-the-scenes antics produced last year titled Space Precinct Legacy. It's really a shame because underneath all the drama, there was a cool premise for a show that could have been a hit. 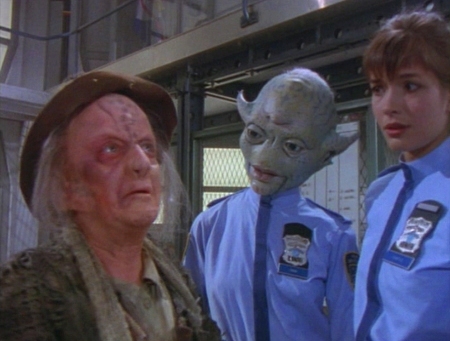 The series focuses on an NYPD Officer Patrick Brogan who is sent (along with a handful of other human officers) to serve as an officer on the far away crime-riddled planet of Altor. 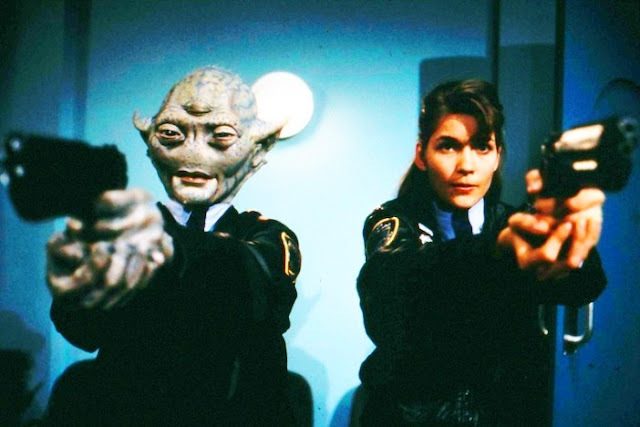 They serve with other alien officers and solve crimes committed by aliens and humans alike. Simple, weird, and Entertaining. 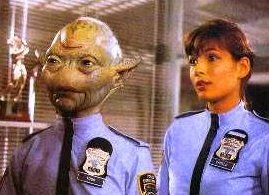 Think NYPD Blue meets Farscape. Although the series was short-lived, there were high hopes for its success and they quickly produced a great action figure line including twelve characters and two vehicles. I think these ladies are such a great example of 1990's action figures. They're just retro enough to fit in with all the other Gerry Anderson action figures (which are modelled on puppets - but these Space Precinct toys are modelled after humans or humans with prosthetic faces). My only issue with the figures are (1) The sticker decals all over the figures want to migrate like crazy. I had the same issue with the Captain Scarlet figures (also from Vivid - they need to get some new glue!) and (2) the plastic of the torso seems to be different from the limbs and over time the torso part of the shirt has discolored on all my figures. I've seen this on many eBay auctions, too. Although I've also seen plenty of non-faded one as well. If you're going to hunt these down, hold out for a non-faded one. Officer Castle comes with an ID Card, a Riot Shield, and a Handgun. She features a classic 9 points of articulation: Knees, Hips, Shoulders, Elbows, and Neck. They have solid construction bodies with no O-Ring waist articulation like we've come to expect on figures of this scale. I love the detail of the white braid on the back of her head. I honestly never noticed it until I got this toy. 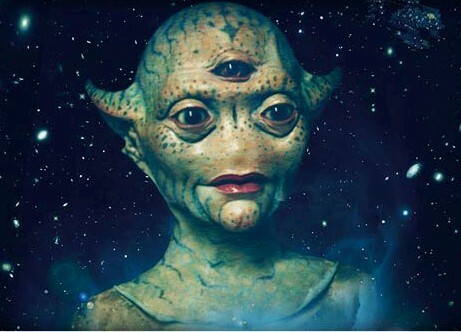 The bump on Took's forehead is actually her closed third eye - which ties in to her telepathic abilities. See those stickers just dying to flutter down to her pants? It's not that they're not sticky, they just don't bond with this particular plastic to well. I need a glue stick stat! Took comes with an ID Card, a Laptop Computer, and a Handgun. Here are some images from the show. From Left to right Stingray's Marina (1992), Terrahawks' Zelda & Kate Kestrel (1983), Captain Scarlet's Harmony Angel (1993), Space Precinct's Officer Took & Officer Castle (1994), Captain Scarlet's Destiny Angel (1993), Terrahawks' Mary Falconer (1983), and Thunderbirds' Lady Penelope (1994). You know your figures and I love all the detail that goes into each post. Great stuff. Thanks! I've been wanting to review these ladies forever but kept putting it off because older figures don't get nearly the attention or traffic that "hot off the truck" toys get. But honeslty, I have so much more fun finding these older gems. Glad you seem to agree! Those final pics with all the older 3.75" ladies are really awesome! The Space Precinct figures are quite interesting. Will have to check out the show at some point. You should definitely check out the show! I like that pic a lot, too. I actually never had them all lined up before (they were scattered on my random 3.75" shelf). I think the only Anderson toys I need yet are the two Konami PVCs of Destiny Angel and Gay Ellis and then the action figure of Destiny Angel from the New CGI Captain Scarlet. I'm in no rush to get any of them though because the first two are hardly "action figures" and the new Destiny looks more like a random SyFy channel character that will hardly blend in with the group. There used to be a selling who had the whole set as a Buy It Now for $39 this summer... I remember seeing it relisted again and again.. maybe it's still up. Good luck hunting! I just received the entire set of Space Precinct figures MOC plus the Police Cruiser! They are such cool little figures. Both Castle & Took are great females (for the time). Haha. I'm a total toy pusher! Glad you like them, did you get ones without the blue shirts discolored? Thankfully the women's shirts were fine, but two of the male police officers have a faded torso. As a kid I was totally creeped out by them, too. Some of the shows would be peppered into my cartoon blocks alongside shows like Robotech and Birdman. I would always change the station right away. But as an adult I think they are great.